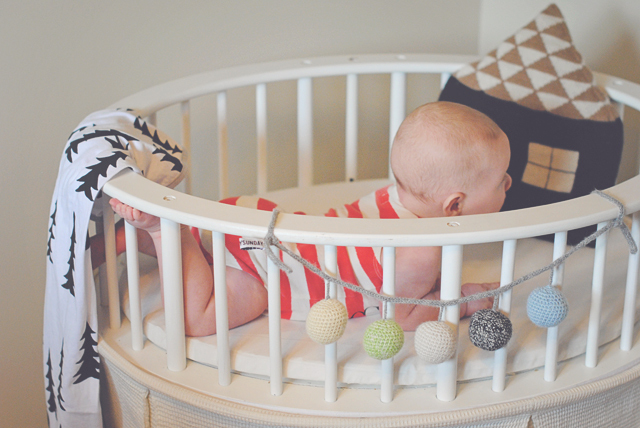 Wrennyn is running out of space in his bassinet! YIKES! He is growing fast and our house seems to be getting smaller. We always knew we would face this challenge, but we weren't prepared for how soon it would hit. Wrennyn has clearly outgrown his bassinet. The sweet little space that has kept him snuggled up beside our bed. When he is bundled and asleep he is just fine, but as soon as he wakes and moves around it is apparent that we need another solution. (ps yes we remove the pillow as he sleeps and I will be removing the garland now that he is starting to reach for things - we know, we know.) I asked my friends and followers on Instagram (see it here) to share some ideas and the response was overwhelming! Thank you to all who passed along any advice I read it all and gave it GREAT thought because this is an important subject matter to me! So I thank you greatly for any ideas I found! 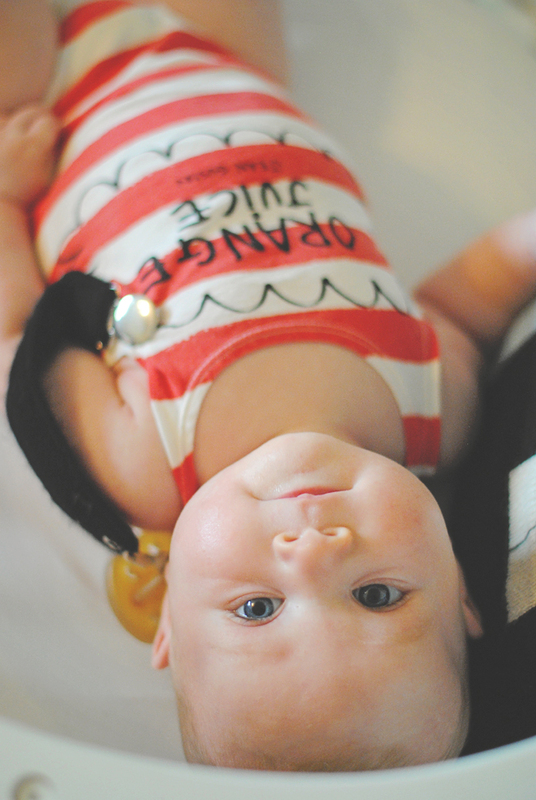 Some of the popular responses were co-sleeping, mini crib, or a pack and play. My thoughts on co-sleeping are iffy. We definitely did not do this with our other boys. It seemed many who do it rave about it and wouldn't change the way they are doing things! I love to hear that! For us we only have a queen size bed and I do not feel comfortable keeping Wrennyn in it as a full-time situation. Andy is pretty unaware while sleeping and I just don't feel like it is right for us in our current bed. A mini crib is also a great idea, but I don't think it would give us enough longevity, considering Wrennyn being in our room may be more of a permanent situation than temporary. Surely he would outgrow that and we would still need another option in 6 months. I am still trying to sift through all of my ideas and find the option that best fits Wrennyn and us. I love having him in our room and I am not ready to change that, it is just more about how we will go about it. Please feel free to keep throwing ideas my way and I can't wait to share with you our solution. It seems many of you share the same problem with having outgrown your current space! Hopefully our experience will help some of you come up with ideas too! I used a "mini co-sleeper" attached to our bed for both my boys and pretty much they lasted until they were 6-9 months depending. 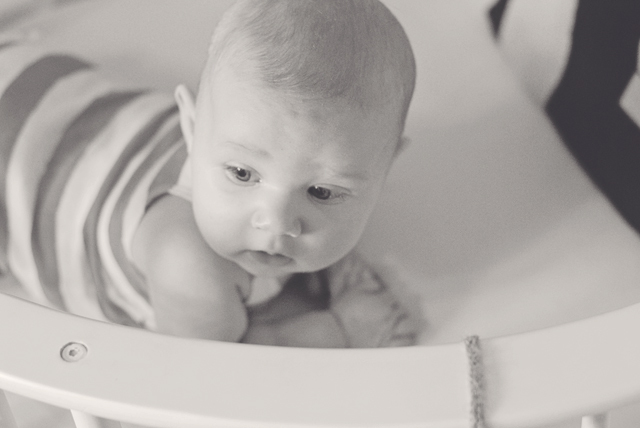 Bassinets are so cute but I never thought about how long they would last for! I don't have a solution, but I agree with you on the play pen. They just seem so "temporary" or something like that. I would definitely go with a full crib if you could. Can you do bunk beds in your other sons' room and fit in a crib in there? You are so right there with me! I am thinking of how to make a full-sized crib work as well! It would be ideal, and still feel like his own little place! We put a full sized crib in our bedroom, as our baby boy will be sleeping in our room until he is 1 yr (at least!). I bought a co-sleeper for the newborn time but did not use it. Like a Pack n Play, it seems temporary...and almost has an institutional feel (to me). Yes! Industrial is a great word, that is exactly how I feel about that option! That is one cute bassinet! WE used our bassinet for 2 months, co-slept for three months (our son was in & out of the hospital then so it was a little sporadic, and then in his crib in his own room at about 5 months. We wasn't quite sleeping through the night but was able to go about 8 hours without eating. It was SO sad to put him in his own room, especially after co-sleeping after being hospitalized! stop growing kid! I meant to tell you this on IG, but forgot. 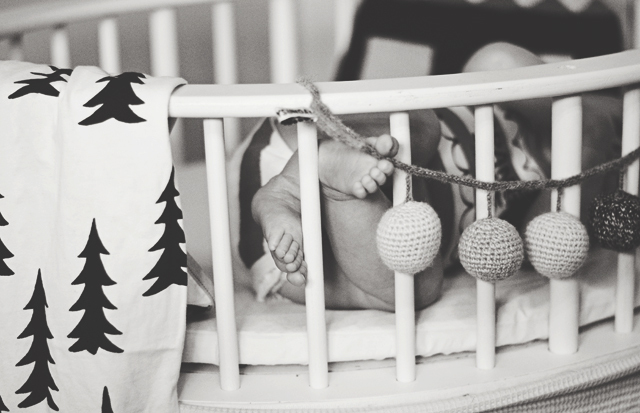 We co-slept with Jacob for a year, but at around 5 months we brought in a crib. It's a regular crib from IKEA, but we set it at the tallest setting with an extra mattress and a blanket underneath, so the height of his mattress was the height of ours. We used bungee cords to keep his crib snug to our bed frame (underneath, so it wasn't visible) and put one sheet across our bed and his. We had a queen sized bed and after a while, it was too much having him in there with us. This still made night time nursing easy since I could just roll over, but we all had our own space. oh, you could use a pool noodle under the sheet to close any gaps between your beds, too. we set his crib between the wall and my side of the bed, too, so that helped keep it snug. I guess I meant to add that it was a good solution for us because once we moved him into his own space, he was in the same crib. In fact, it turns into a toddler bed, so it's useful for many years!